Take off the garments of doubt,fear,sadness ,and replace them with Godly garments . “To console those who mourn in Zion, To give them beauty for ashes, The oil of joy for mourning, The garment of praise for the spirit of heaviness; That they may be called trees of righteousness, The planting of the Lord , that He may be glorified.”(Isaiah 61:3 NKJV). 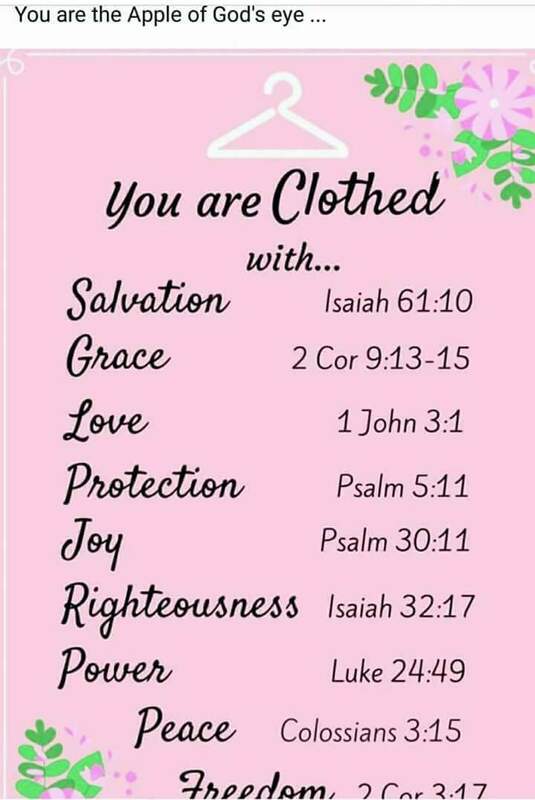 “I will rejoice greatly in the Lord , My soul will exult in my God; For He has CLOTHED me with garments of salvation, He has covered me with a robe of righteousness, As a bridegroom puts on a turban, And as a bride adorns herself with her jewels. For as the earth brings forth its sprouts, And as a garden causes what is sown in it to spring up, So the Lord God will [most certainly] cause righteousness and justice and praise To spring up before all the nations [through the power of His word].”(ISAIAH 61:10‭-‬11 AMP). “For all of you who were baptized into Christ [into a spiritual union with the Christ, the Anointed] have CLOTHED yourselves with Christ [that is, you have taken on His characteristics and values].”(GALATIANS 3:27 AMP). “Put on the full armor of God [for His precepts are like the splendid armor of a heavily-armed soldier], so that you may be able to [successfully] stand up against all the schemes and the strategies and the deceits of the devil. For our struggle is not against flesh and blood [contending only with physical opponents], but against the rulers, against the powers, against the world forces of this [present] darkness, against the spiritual forces of wickedness in the heavenly (supernatural) places. Therefore, put on the complete armor of God, so that you will be able to [successfully] resist and stand your ground in the evil day [of danger], and having done everything [that the crisis demands], to stand firm [in your place, fully prepared, immovable, victorious]. So stand firm and hold your ground, having tightened the wide band of truth (personal integrity, moral courage) around your waist and having put on the breastplate of righteousness (an upright heart), and having strapped on your feet the gospel of peace in preparation [to face the enemy with firm-footed stability and the readiness produced by the good news]. Above all, lift up the [protective] shield of faith with which you can extinguish all the flaming arrows of the evil one . And take the helmet of salvation , and the sword of the Spirit, which is the Word of God. With all prayer and petition pray [with specific requests] at all times [on every occasion and in every season] in the Spirit, and with this in view, stay alert with all perseverance and petition [interceding in prayer] for all God’s people”. (EPHESIANS 6:11‭-‬18 AMP).